Most visitors come to Denali National Park in Alaska in the summer when daytime temperatures are usually in the 50s and 60s, although they can climb to 90F. These cool 10 to 20 degrees overnight for a daily temperature range of about 22 degrees in summer. Here are the averages by month so you can get an idea of what conditions to expect. Keep in mind that the length of day and night varies far more than you may be used to in the lower 48 states. The nights are much longer in the winter while the period of darkness is very short during the summer. It is smart to dress in layers with a shirt, insulating layer of a vest or wool shirt, and a waterproof/windproof jacket. This allows you to put on and take off a layer for comfort during the day. Extreme temperature swings are more common in the winter when there can be as much as a 68-degree Fahrenheit change in temperature in a single day. The north side of the park is drier and has larger fluctuations in temperature. It is colder in the winter and hotter in the summer than the south side of the park. The temperature and weather will also change with altitude. If you are going to be climbing, you should study the mountain weather observations posted on the National Park Service website. They have daily observations for throughout the April to July climbing season at the 7200-foot camp and the observations made by those who reached the 14,200-foot camp. These show the sky conditions, temperature, wind speed and direction, gusts, precipitation, and barometric pressure. 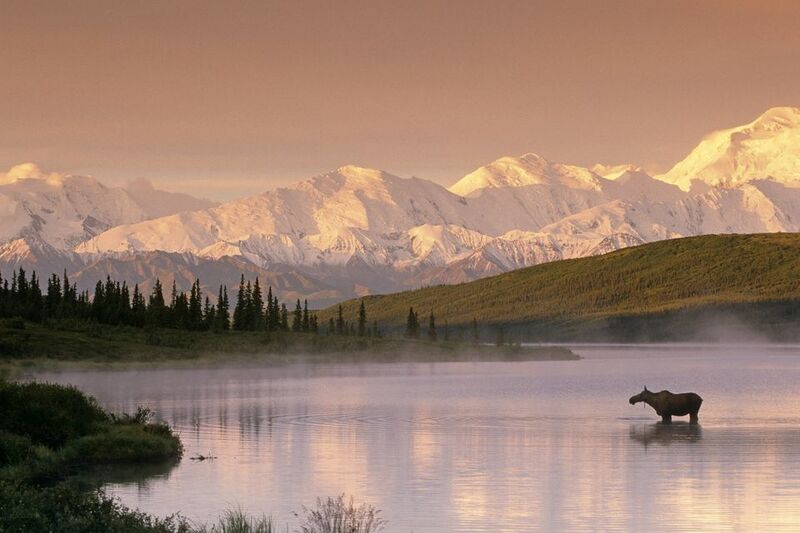 There is a large variation in the altitude you can experience in Denali National Park. The lowest is at the Yentna River, only 223 feet above sea level. As you climb to higher points or descend to lower points, you may see rain turn to snow and vice versa. Temperatures can vary significantly at the same time at different altitudes, as can wind speed, clouds, etc. The Denali Visitor Center is at 1756 feet above average sea level, the Eielson Visitor Center is at 3733 feet, Polychrome Overlook is at 3700 feet, the Wonder Lake Campground is at 2,055 feet, and the summit of Mount Denali is at 20,310. It is the highest point in North America. Summer visitors to Denali hope to catch a glimpse of the mountain through the clouds and most are disappointed. The National Park Service maintains several webcams that can show you the current conditions. These include the Alipin Tundra webcam on the shoulder of Mount Healy and the visibility webcam at Wonder Lake.